Each year there is a certain excitement when it comes to ordering squash and pumpkin seeds. The number of varieties available is always a bit of overwhelming, but I do have my favorites that make half the exercise pretty straight forward. For the other half I take great delight in the idea, and eventually the reality, of growing varieties that offer not only food for winter storage, but in the beauty found in their colours, shapes and textures. Two of this year’s favorites are Galeux D’Eysines and the Styrian Hulless. Galeux “is an elegant French heirloom with an appropriately elegant sounding name. This stunning squash has beautiful salmon-peach colored skin covered with peanut shell-like warts caused by sugar in the skin. Traditionally used in France for soups and sauces, when cooked, the sweet, orange flesh is as smooth as velvet. Definitely a show stopper in the garden or on the table. ” I made up a batch of Spicy Squash Soup which was indeed as smooth as velvet. The Styrian Hulless was looked forward to with great anticipation…for the seeds inside. “Originally from Styria, which is an area of Austria, this heirloom was grown for its large hull less green seeds. The seeds were pressed for pumpkin seed oil and are very nutritious and delicious!” As its name implies, those seeds are without the hard, crunchy, sliver like hulls that other pumpkins seeds have. Ripping into that pumpkin for its seeds was both satisfying and disappointing. After an all night soak in water and sea salt, and a low temperature roast the seeds were to die for. As a matter of fact they were so good that bisecting the remaining 25 pumpkins for a mere 1 cup of seeds per pumpkin seems worthwhile. However, when the math is done it seems like an inordinate amount of garden space and a lot of work for such a delight. This is the downside of this hulless seed pumpkin. 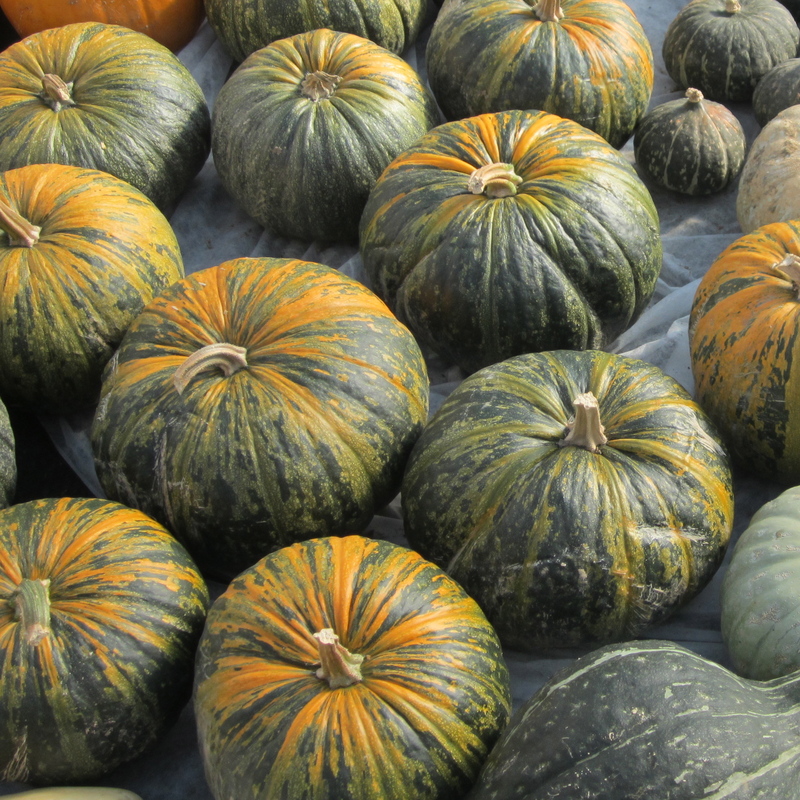 We grew many more varieties of winter squash and pumpkins, all of which have excellent nutritional and economic value. A lot of good food comes in one large squash. All varieties are great for puréeing, roasting and baking. Once squash is cooked and mashed, it can be used in soups, main dishes, vegetable side dishes, even breads, muffins, custards and pies, and it can be stored frozen until needed. We have put away enough to keep us going for the winter. They sit, in their beauty, in our cold room, and take up a section of our freezer waiting to be made into pies and such over the long winter months. Soon, we will start to enjoy the fruits of our summer labors! SOME RECIPES I HAVE USED…with minor adjustments for taste, and switching up one squash for another. Black Bean Chili with Butternut Squash and Swiss Chard – I used the Galeux d’esyines squash and a mix of kidney beans and rattlesnake beans. The second time I tried this recipe I used it as stuffing for a larger squash (Sweet Meat), and to feed a large group of people. How to Make Homemade Pumpkin Pie – from a Real Pumpkin, Not a Can! – I used half Green Hubbard squash and half Jack of all Trades pumpkin. It was quite thin in its raw state but baked up nice and firm…the best pumpkin pie that has been made in my kitchen! Spicy Squash Soup – I love ginger so added considerably more. NOTE: To store your unprocessed winter squash place it, whole, onto a dry surface in a cool, dry and ventilated location. The ideal storing temperature is between 7 and 10 degrees celcius. Under the right conditions your squash should keep up to 3-6 months depending on variety. 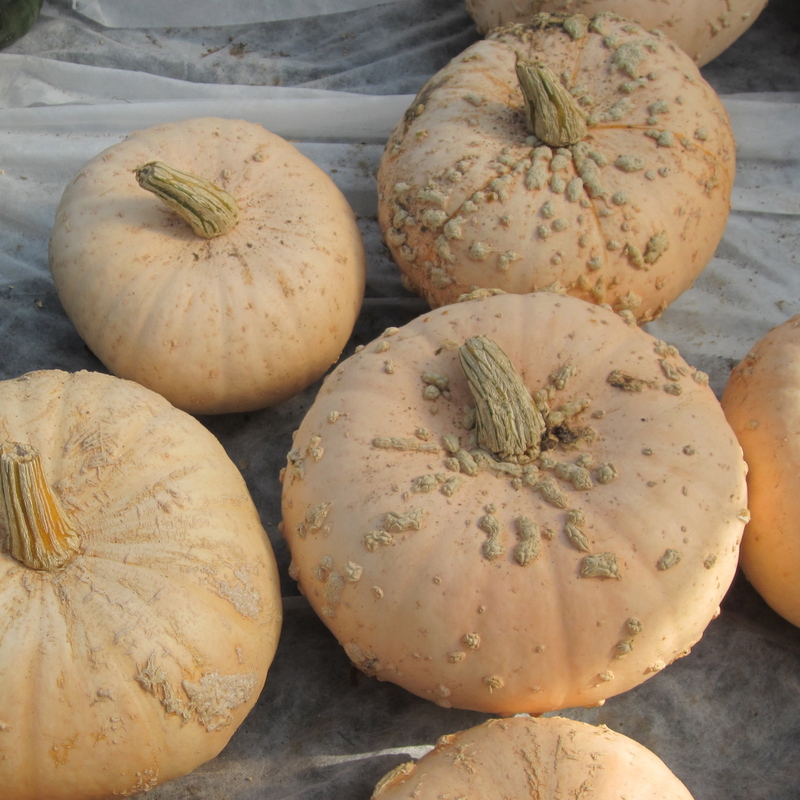 Check on a regular basis for rot, and remove any with mould spots so that it does not spread to other squash.